The day of my engagement shoot with Jason and Erin turned out about as perfect as it could be. The weather was great the whole time and the last hour of our time together the natural light was amazing. We started out in downtown Sandpoint, starting in the one and only alley that the town has to offer and then finished up our time down by the lake. 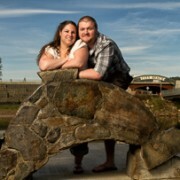 We had a great time and I can hardly wait for their July wedding!